That’s right, it’s Christmas time. The time of the year that even the world stops to acknowledge and celebrate the birth of our Lord and Saviour, Jesus Christ. While many in the world remember him as still a baby, we acknowledge the birth of the messiah, the king of all creation. 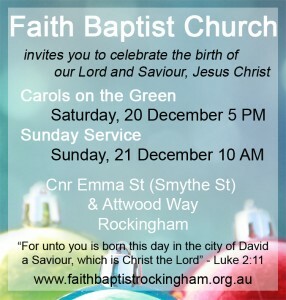 If you’re in Rockingham we’d love for you to come along and join one our services. This year there are two main services at our Church building, on the corner of Emma St (Smythe St) and Attwood Way in Rockingham. There will be a ‘Carols on the Green’ service on Saturday, 20 December 2014 at 5 PM. Bring along a picnic blanket or a chair and a loud singing voice. There will be some sausages and other bits and pieces provided as part of the fun. The Christmas morning service will be on Sunday, 21 December at 10 AM. Come along and hear the true story of Christmas preached from God’s word, the Bible. WP-Bible plugin KJV] 11 For unto you is born this day in the city of David a Saviour, which is Christ the Lord.